Once the holidays are over, I begin thinking about new plants for the garden. Here are some of my favorite mail-order nurseries for perennials, trees and shrubs that you will want to peruse in 2019. Do you have other favorites? Please share them with others in the comments section! It can be tough to find perennials that dazzle in all four seasons, but Hakonechloa macra, commonly called Hakone grass, is a plant that fits the bill. Hakone grass is a beautiful perennial grass with gracefully arching leaves that sway in the breeze. It grows slowly to form a cascading mound of eye-catching foliage and has a strong presence in the garden year round. Although most grasses prefer full sun, Hakone grass is a shade-loving grass native to moist mountain and woodland areas in central Japan. Mt. Hakone, gives it both its genus name and common name, and it is also commonly referred to as Japanese Forest Grass. Its native habitat also gives a clue to its water requirements. Although this grass can grow in full sun and deep shade, it needs consistent moisture – not wet feet, but regular watering. Hakone grass is a tough, long-lived perennial that is easy to grow and has no serious insect or disease problems. 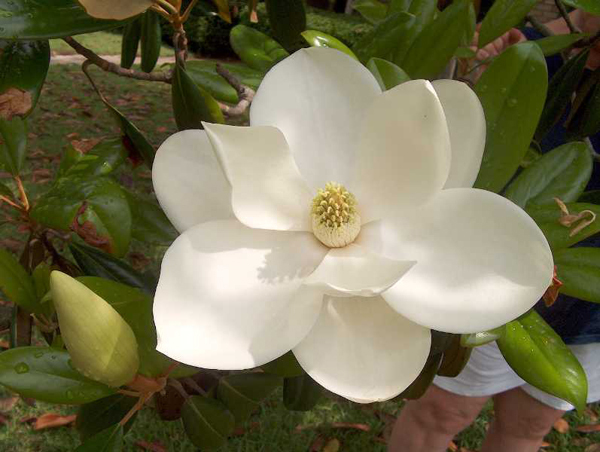 It performs best in part shade and humus-rich, well-drained soil. Leaves may scorch in hot summers, particularly when consistent moisture is not maintained. A winter mulch is recommended, but I have found no need for this. Clumps spread slowly by rhizomes, but are not invasive. The plant ultimately grows to about 24” wide by 18” tall, and produces delicate sprays of green flowers in summer. The leaves have a papery texture that resembles bamboo. Hakone grass is best divided in spring, but because it is a slow grower, division will not be necessary for many years. The foliage turns a soft copper color in late fall, and can be left on the plant to provide winter interest. It should be trimmed to the ground in early spring before new shoots emerge. There are two popular varieties of Hakone grass. Just as its name implies, ‘All Gold’ gleams in the garden and holds its brilliant color from spring through fall. It will be chartreuse in shade, and yellow gold in full sun. ‘Aureola’ is a golden-striped form that grows to 15” tall and features gracefully arching green leaves variegated with gold longitudinal striping. It is slower growing and less winter hardy than the straight species or ‘All Gold'. Leaf variegation color is affected by the amount of sun exposure and the growing climate. Hakone grass has many uses in the garden. It can be grown as a specimen in a container. It can be massed as a ground cover in the landscape. "Grass Painting" at Bedrock Gardens. Shady entrance area at Tower Hill Botanical Garden. 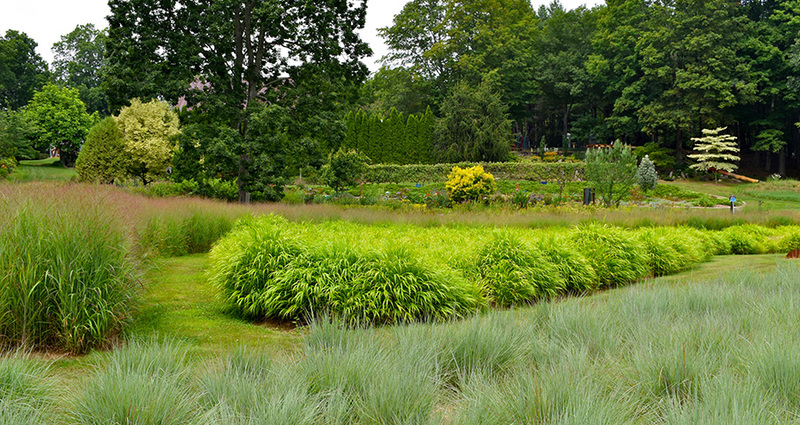 Hakone Grass makes a perfect focal point in the shade garden. At the Elizabeth Park perennial garden. Hakone Grass is brilliant in all four seasons. It adds bright color in early spring, and is a brilliant companion to spring bulbs. Early spring with ajuga at Elm Bank. Mid-spring with tulips at Tower Hill Botanic Garden. It adds softness to paved areas and stone elements, and drapes beautiful on slopes and over garden edges. Its fine texture makes a lovely contrast with hostas and shade perennials, including heucheras, epimediums, ferns and hellebores. Once you start growing hakone grass, you will continue to find new ways and new places to use it! March is a great time to peruse plant catalogs, websites and flower shows in search of the new and garden-worthy. Here are 10 intriguing new plants for this year's perennial gardens. Joan and I had the pleasure of presenting our lecture "Spring Ephemerals and Other Delights" at Blithewold last April. For those of you that have never been there, Blithewold is a 33-acre estate with a 45-room mansion framed by a series of lovely gardens overlooking Narragansett Bay in Rhode Island. The property was purchased in 1895 by Augustus and Bessie Van Wickle, and served as the family summer home. The gardens were designed in the late 1800s, and feature a 10-acre lawn, an arboretum of specimen trees, perennials gardens, and a "bouquet" or scenic woodland. Bessie and her daughter Marjorie were ardent gardeners and turned the estate into a horticultural showplace. Blithewold is beautiful in all seasons. In the spring, the rose garden, framed by an Asian-inspired moon gate, blooms with colorful bulbs and early perennials. Tulips, leucojum, grape hyacinths, bleeding hearts, euphorbia and other perennials welcome you to the Blithewold estate. Century-old trees present a sculptural beauty even in early spring, before they leaf out. 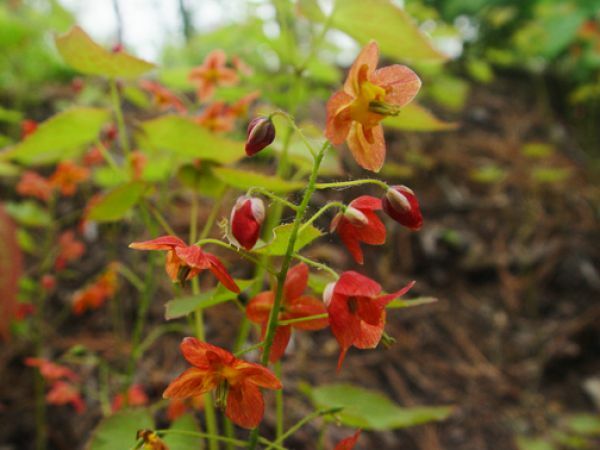 Some are underplanted with shade and drought-tolerant perennials such as epimedium (below). The chartreuse leaves of ginkgo trees are a delight when viewed against the mature deep green conifers. The Bosque is planted with thousands of daffodils and a carpet of spring ephemerals including mayapples (above) and erythronium, also known as trout lilies (below). These woodland plants bloom while there is ample sunlight before the trees leaf out, and become dormant in the summer. The Van Wickles used stone from their property to create rock gardens and garden ornaments such as the whimsical stone bench below. Flowering crabapples frame the view of Narragansett Bay. In April, you can view more than 50,000 daffodils in bloom. In May, see the Magnolias, Flowering Cherries, Honeysuckles, Weigelas, Lilacs, and Viburnum, along with hundreds of blooming perennials. Joan and I will be back at Blithewold on Monday, May 8 at 1:00 pm, presenting our "Propagating Perennials" workshop. Hope you can join us! Every gardener wants a lush, colorful garden that brims with excitement and interest throughout the year. But how do you achieve this? By creating a "layered garden" - one in which the plantings are carefully selected to provide a succession of interesting combinations (or layers) from spring through fall. 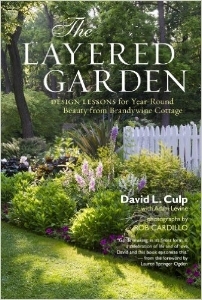 "The key to creating a many-layered garden is understanding and taking advantage of the ways plants grow and change through the seasons and over the years, providing different textures, colors, and effects and evoking a variety of feelings. Garden layers are made up of a variety of plants, some with complementary or contrasting colors, other with interesting shapes and textures." I created my layered perennial garden so that I would have a nice view from my kitchen windows. I wanted to use bright, "hot" colors somewhere on my property, and this location seemed ideal since it was a little further from the house. This kidney-shaped island garden was originally planted around a lone small apple tree that later succumbed to disease. It was replaced by the white tuteur, made for me by my brother-in-law. The shape of the tuteur echoes the dwarf Alberta Spruce on the left and provides a focal point for the garden in all seasons. Although the garden has gone through many changes, the concept and some of the plantings have not changed in 24 years. The kidney garden has grown over the years to its current size of 28' long and 24' deep. It has always had small access paths so that I would not have to step on the soil. The first blooms of early spring are daffodils and species tulips. I moved and divided my forsythia bush so that it would be a colorful backdrop to the blooming daffodils. The daffodils are interplanted with daylilies, so as the daylilies grow, their foliage hides the foliage of the daffodils. The species tulips bloom in April. Unlike most tulips, they are short in stature and truly perennial. They also have beautifully mottled foliage. In early May, Darwin tulips and forget-me-nots begin to bloom, along with the PJM rhododendrons in the background. The forget-me-nots self-sow from year to year. Once they are done blooming, I remove most of them so make room for emerging perennials. The fritillary, also called "Crown Imperial", is a regal bulb. Darwin tulips are more hardy than many other varieties and return year after year. I add more bulbs every 4-5 years to keep my spring show going. One of the joys of the layered garden is that it allows for flexibility, letting me change the predominant colors of the garden several times during the year. By early June, the color scheme of the garden has transitioned to blue and yellow. Bulbs are key to achieving a layered look. They take up little space, and their foliage completely dies back later in the season, making room for other plants. Baptisia produces tall spikes of bright blue flowers and handsome blue-green foliage. It is now the size of a shrub, and I stake it to keep it upright all summer long. Allium 'Globemaster' produces giant purple globes on sturdy tall stems. It's especially vibrant next to the 'Goldheart' bleeding heart. 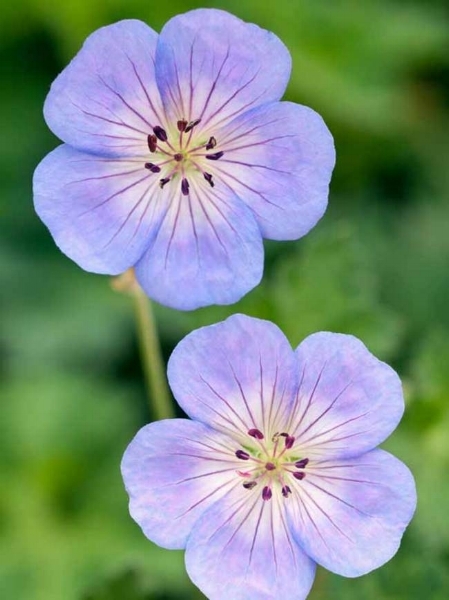 I purchased these 'Johnson's Blue' geraniums from Bluestone Perennials more than 20 years ago. They have been divided several times, and continue to form a cloud of blue in June. My tuteur sports clematis 'HF Young' - a variety with giant flowers. Climbing vines are another asset to a layered garden - they add height, but have a small footprint. Centaurea montana, or perennial Bachelor's Button has beautiful azure flowers. In late June, the garden turns to gold and green with the prolific blooms of daylily 'Stella de 'Oro'. I try to plant the perennials in large swaths so that they have impact in the garden from a distance. Several self-seeding plants weave through the perennials. I remove some in the spring, and leave the others to create an informal English cottage look. Golden feverfew, one of the self-seeders, provides bouquets of tiny daisy flowers and bright chartreuse foliage. Coreopsis 'Zagreb', also known as Tickseed, is a long bloomer in full sun. Daylilies begin their show in July. 'Margaret Seawright' is a gorgeous bi-colored variety. Daylily 'Bloodline' complements its neighbor, scarlet Bee Balm. The feathery gold foliage of Spirea 'Ogon' and Amsonia contrasts with the strappy foliage of daylilies. Purple Perilla is another self-sower that adds drama to the late summer garden. Several varieties of helianthus and rudbeckia create great cut flowers for the house. These Orienpet lilies add a wonderful fragrance to the entire garden. They came as a set of 25 unnamed bulbs from White Flower Farm. I grew aster 'Nova Anglie' from seed 24 years ago, and if the woodchuck does not get it, it provides armloads of flowers in September. Rudbeckia, zebra grass and perilla in the autumn garden. I like the planting to be full - no mulch visible. Sedum 'Autumn Joy' and Michaelmas daisy welcome autumn. Always consider your garden's backdrop. 'Karl Foerster' grass, variegated sedum, a golden cypress and burgundy Witherod Viburnum provide a lovely background for the garden in late fall as the perennials die back. February is a terrific time to choose new plants for the garden. Here are some of my favorite mail-order nurseries for perennials, trees and shrubs. Do you have other favorites? Please share them with others in the comments section! Santa Rosa Gardens offers an extensive selection of perennials with an emphasis on ornamental grasses - there are 182 varieties of grasses on offer! Most of the plants are sun lovers, and you will be pleased with the number of varieties to choose from - 13 types of agastache, 32 varieties of coreopsis, 14 Gaillardias, 44 Sedums, and more. In addition to standard 3-1/2" pots, you can also order perennials in flats of 72 if you are doing a mass planting. Santa Rosa Gardens is family-owned grower that has been in the horticulture business for four generations and offers excellent customer service. Most parts of Massachusetts and, in fact, much of the Northeast experienced a summer-long drought. 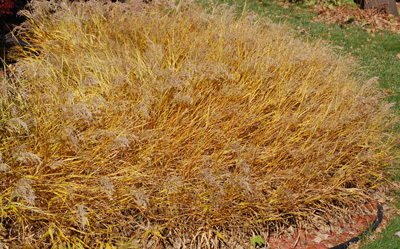 This affected many perennials, trees, and shrubs, both in the wild and in our gardens. As our cities and towns enacted strict water bans, we gardeners watched helplessly as our new plantings and even established plants yellowed and then browned. Although the drought seems to be finally over this month, what can we expect in the coming year as a result? Contrary to popular perception, droughts are seldom one-year events. “Droughts are multi-year events; they take some years to develop. And like the others, this one will be felt for longer than one season. When soils are so dry, even with the recent rainfall, it will take time for the hydrologic system to recover.” This means that even though we may see closer to normal rainfall next year, water bans are likely to continue since it will take several years our groundwater supplies to be replenished. During the severe droughts, trees and shrubs will exhibit wilting leaves, marginal leaf scorch and premature leaf loss. Don’t be too hasty to replace plants that appear to have dried up, however. Plants that look dead may actually have living tissue underneath the bark or in the ground. You can check on woody plants by scratching the bark to see if there is green tissue underneath, and wait until next spring to see if these plants leaf out. Keep in mind that it may take several years for a woody plant to completely recover from drought stress. You may see plants with less vigor, increased dieback during winter, and more susceptibility to pests and diseases. “Many woody and herbaceous perennials that bloom early in the season set their buds the previous year. These include lilacs, forsythia, peonies, and many daylilies. Even the later bloomers may have less growth next year as a result of the stresses this year. So, keep an eye on these and, if they are not at their best this coming year, don't despair but have patience!” writes Dr. Leonard Perry, Horticulture Professor Emeritus at UVM. So if your plants do not exhibit their usual spring glory, pamper them a bit and wait patiently until the following year. Some of my perennials such as astilbes dried to a crisp this summer, and I was afraid that I may have lost them permanently. The recent rains have revived them, and fresh green growth has reappeared. Bob Sohlberg, hosta breeder and owner of Green Hill Farm, warned that next year’s hostas and other perennials may be smaller in size due to this year’s drought. He recommended a foliar feed of tomato fertilizer to bulk up hosta leaves next year. Mark Richardson, Director of Horticulture at Garden in the Woods, noted that plants produced fewer seeds due to the drought this year. The New England Wildflower Society propagates many of its plants through seed collection, and seed gathering was much less successful this year. If you have self-seeded foxgloves or other beauties in your garden, you may see less of them next year. My weeds did not get the drought message however – they have been as bountiful as ever. This was the second year in a row that a lack of springtime rain triggered an explosion of voracious gypsy moth caterpillars in Massachusetts. Drought conditions impeded the spread of a fungus that usually keeps the number of gypsy moth caterpillars under control. If we have normal springtime rain next year, the gypsy moths should decline in number. 2017 may be a challenging year in the garden, but I am already looking forward to spring as I plant my bulbs and put the garden to bed. And by next April, every blossom and green leaf poking out of the ground will be a miracle, no matter how small! The native deciduous azalea prunifolium, started from a rooted cutting, is now a sturdy 3 foot tall shrub. This unknown variety of helenium received from a friend has been cheering up the perennial bed for 15 years. Beebalm, shasta daisies and a variegated grass engulf the obelisk. A progression of blooms in the daylily border delights me with new flowers every day. A chartreuse form of feverfew has self-seeded throughout the garden, and its miniature flowers bloom for weeks. Clematis Huldine has outgrown its trellis and is spreading on the ground and scrambling up the wall of the garage. A beautiful rose daylily is complemented by 'Blue Star' Juniper below. Also known as Wood Hyacinths, Spanish Bluebellls (Hyacinthoides hispanica) are charming additions to the spring garden. The pale blue, dangling bells complement yellow daffodils, red tulips, white lily-of-the-valley, and many other spring flowers. Spanish bluebells are bulbous perennials native to Spain, Portugal and northwest Africa. Each bulb produces a clump of 2-6 strap-shaped leaves and a flower stem with 12-15 hanging, bell-shaped flowers. The plants are 12-18" tall. The bulbs are inexpensive, readily available, and easy to grow, so if you are new to bulb gardening, they are great plants to try. Hardy in zones 3-8, Spanish bluebells will grow in full sun to part shade, and are not fussy about their soil requirements. They are good naturalizes, spreading both through bulb offsets and seeds. Here in New England, they will spread discreetly but steadily, making a cheerful community. Like other spring bulbs, they should be planted in the fall, and will bloom in early April to early May. The leaves will disappear as the plants go dormant for the summer. Spanish bluebells are versatile additions to the garden. In addition to the classic blue form, there are pink and white varieties available. They look great sprinkled among other spring bulbs in a sunny garden, or combined with bleeding hearts, geranium macrorhizum and epimediums in a shady border. You can plant them around the bases of hostas, and as the hosta leaves unfurl, they will hide the bluebells' yellowing foliage in late spring. They also complement spring-blooming shrubs, and look great massed in a woodland or naturalized in large drifts under deciduous trees. No matter where they are planted, Spanish bluebells create a delightful, cottage-style garden. Hellebores have become one of my favorite plants since I began growing them about 10 years ago. They bloom at a time when the garden is mostly dormant - from late fall to early spring - and bring a smile to my face every time I see them bravely holding up their blossoms against the harsh weather. They are easy to grow, virtually care-free, and there are wonderful new varieties introduced every year. This hellebore Niger began blooming in early December due to our warm winter this year. Hybrid hellebores are expensive to purchase (about $17 for a one-gallon pot) because it takes three to five years for them to bloom, and growers generally only sell blooming plants. You can buy smaller plants through mail order. But the most economical way to increase your collection is to propagate your own plants. You can divide all hellebores except the caulescent varieties (H. argutifolius, H. livius and H. foetidus). To divide a hellebore, dig up the entire plant, wash the crown free of soil in order to better see what you are doing, and then cut between the growth buds with a sharp knife. Try to leave at least three buds in each division so that the plants will recover quickly. For your first experience, select a plant that has 5-10 flowers on it. Older plants are very woody in their center. Make sure that you have a very sharp knife. I keep a small pruning saw with a serrated blade just for the purpose of dividing perennials. Make sure that each division has a portion of the center along with the newer growth from the edge of the plant. Plant your divisions in full shade to almost full sun. Add compost to the planting hole, firmly tamp down the soil, water, and mulch. I also water with a high-phosphorous fertilizer to encourage good rooting. Divisions should be kept moist throughout their first growing season until frost. One of my hellebore gardens with divisions from my own plants. Another way to add hellebores to your collection is to grow on any seedlings that have rooted around the mother plant. Not all hellebores produce seeds - some are sterile hybrids. But many of the orientalis type do set seed every year, and if you look carefully, you will see little seedlings growing around the mother plant. These seedlings should be moved to a nursery location after they have developed a true set of leaves, so that they will not be shaded out by the mature plants. I grow them on for about two years in a nursery bed, and then plant them out in the garden, eager to see what these babies will look like when they bloom. Seedlings with fully formed leaves at the base of the mother plants. Two-year old seedlings in the nursery bed where they enjoy beautiful soil and no competition from other plants. Hellebore foetidus produces many seedlings in my garden, and I find them in random places where they have planted themselves. Since foetidus is not a long-lived plant, you should keep some seedling growing by the mother plant so that you continue to have hellebores in that spot. Because they have finely cut foliage, these hellebores do not shade out their babies. I have so enjoyed slowly collecting new cultivars, dividing my plants and growing on hellebores from seed, that I now have about 50 hellebore plants throughout my garden. And when I see them blooming every winter, I know that I will add more! Every year I focus on updating a different section of my garden, and this is the year of the rose bed. I have always grown roses in my garden - in fact they were the first flowers that I planted when we moved into our house in 1992. Six roses came on the moving truck with us from the city - I grew them in pots on the porch of our rented apartment in Somerville, and overwintered them in the unheated stairwell. They went into the ground in a circular bed in my front yard, created by the previous owner's leaf pile that had been left there over the winter. Most of them did not survive that exposed, windy location, pummeled by northwestern winds all winter long. I was a novice gardener, and did not realize that my tender hybrid teas needed winter protection. But despite my lack of success, I was determined to grow roses in my garden. Aloha Rose was one of the roses that I brought from my city apartment, and it blooms to this day on my trellis. I created new beds in sheltered locations, and ordered barefoot rose collections - hybrid teas from Jackson and Perkins for the bed bordering my stone garage, fragrant David Austin roses to grow along the fence. The roses were undoubtedly fussy plants - ravaged by aphids and Japanese beetles, and stripped of their leaves due to blackspot and other fungal diseases. Despite winter protection, some reverted to their Blaze rootstock, so instead of a yellow shrub rose, I ended up with another red climber that bloomed only once a year. But when they were in bloom, the roses were gorgeous. Every year, my children lavishly decorated the table with roses for my Mother's Day breakfast, and made elaborate bouquets for my June birthday celebration. They even brought me a bouquet of my roses when I was in the hospital one early November. So even as I debated whether I should continue growing these beautiful, fussy flowers, I knew that I could not give them up. I decided to go on a quest for roses that were winter hardy, disease-resistant, fragrant, re-blooming, and had the "cabbage-rose" look of old-fashioned roses that I love. At the Connecticut Flower Show, I attended a wonderful lecture by Mike and Angie Chute (RoseSolutions) entitled "Twenty-Five Fabulous Roses". Mike and Angie just published a book of 150 easy to grow, sustainable roses: Roses for New England: A Guide to Sustainable Rose Gardening. I was delighted to learn about roses that could be grown here in Massachusetts without winter protection and without constant fungicide or pesticide application. Most of these are hybrids that have been developed in the last 15 years. While Mike shared his list of 25 favorite roses, I asked him to point out those that were also fragrant. Sadly, in an effort to hybridize for hardiness, disease-resistance and a long season of bloom, modern hybridizers had sacrificed fragrance. Of the 25 roses on Mike's list, only 6 were fragrant. I also found a second excellent guide to disease-free roses by Peter E. Kukielski, Roses Without Chemicals. Peter is the former curator of the rose garden at New York Botanical Garden, and this book highlights 150 tough new varieties of roses that perform well in all kinds of conditions. 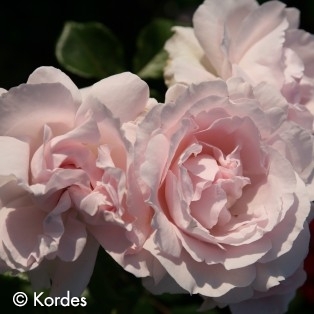 Each rose in the book has a detailed description along with a point rating which includes scores for disease resistance, bloom, fragrance and an overall score. Cross-referencing both lists, culling out only fragrant roses and those with full, cabbage-rose heads, choosing those hardy to our zone and those that grew in a particular size range, I came up with a list of about 15 roses. Now the challenge was to find them for sale. I decided to order them via mail-order so that I could get them in the ground early. Nurseries often do not have roses until May. I was also looking primarily for bare-root, because I think that it's easier to establish bare-root shrubs in the garden. Some nurseries have already closed bare-root orders for the season. In the end, I was only able to find about half of my list, and placed my orders at White Flower Farm, Heirloom Roses, and Palatine Roses in Canada. My final selection (from top left): Ascot, First Crush, Lion's Fairy Tale, Mother of Pearl, Pomponella, Summer Memories, and Cinderella (top of page). I'm very excited to try these new roses, and will let you know how they perform! The color blue is overwhelmingly chosen as the most popular color by both men and women, so it is no wonder that we are drawn to blue flowers. Blue is a soothing color that evokes feelings of calm, trust, honesty and loyalty. Blue flowers add a touch of tranquility and cool elegance to the garden. They make excellent bedfellows in the garden, blending and complementing other hues. I love combining blue flowers with violet, pink and white hues and silver foliage in a sunny summer border, or juxtaposing them with bright yellows and oranges for a dynamic “pop” in the spring garden. Blue flowers are particularly rare in autumn, and the deep indigo-blue flowers of Monkshood punctuate the oranges and golds of this season. Also known as False Indigo, this late emerging, statuesque perennial with spires of pea-like flowers and handsome blue-green foliage is a focal point in the perennial bed. This perennial bachelor button is a cottage garden favorite, with furry gray-green leaves similar to lamb’s ears, and large, brilliant blue flowers. Perennial geraniums with their delicately cut foliage and low spreading habit are beautiful companions to tall, upright perennials, roses and shrubs. One of the earliest flowers to bloom in spring, pulmonaria sports showy, lance-shaped leaves with silver spots, and deep blue flowers that change to violet and rose as they age. Spires of brilliant blue, trumpet-shaped flowers on a perennial that gently seeds itself in the garden. A charming little plant, Dwarf Crested Iris is easy to grow, pest-free, and provides amethyst-blue flowers for the shade garden. This catmint sports compact mounds of aromatic gray-green foliage with lavender-blue flowers. With irresistible balloon-like buds that open to bright-blue, five lobed flowers, Balloon Flower is a late-emerging perennial that blooms in late summer. The Primrose is among the first of the flowers to bloom in the spring garden. The Latin name, Primula, means “first”. Primula is a genus of about 425 species that occur in a wide range of habitats, from bogs and marshes to alpine areas. They are widely distributed in the Northern hemisphere, mostly in Europe and Asia. Most are extremely cold hardy, some to Zone 3. Primula have linear to ovate green leaves in basal rosettes, and attractive flowers that are salvoform (thin tube with flat petals) or tubular or bell-shaped. Many are fringed. The flowers are often produced on slender to thick flower stalks in umbels, whorls or spikes. Primula species that are native to the US are found in the western part of the country, primarily in mountain regions. They require thoughtful placement in garden settings in the New England. 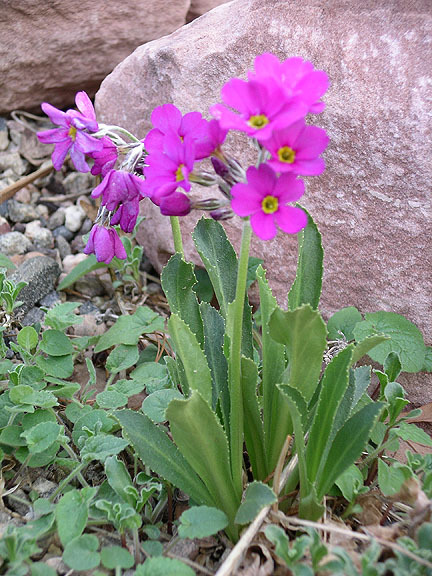 Primula rusbyi, the Rusby Primrose (Z3), is native to the mountains of the Southwestern US. It has rosette-forming, toothed green leaves and salverform rose-red to deep purple flowers. It’s useful in alpine and rock gardens with reliable moisture. Other Primula species, however, grow very well in our area and provide unique beauty and brilliance to the spring garden. Primula veris, or Cowslip, native to Europe and West Asia, is very successful in my garden in dappled shade in rich soil. I have planted a cultivar named ‘Cabrillo’ in a slightly low area, not boggy at all, but never overly dry. It has sweet-smelling, brilliant yellow blossoms, and is the first primrose to bloom. Cowslip has a long history of use in herbal and folk remedies to treat a variety of ailments. Its leaves have been used in teas to cure nerves and anxiety, its flowers to treat bruises, and its roots as an expectorant to break up mucus. In 17th century England, applying water distilled from cowslip, or an ointment made from cowslip flowers, was thought to make one more beautiful. Another primrose that is exceptional in our area is Primula seiboldii (Siebold Primrose, Z4). It has showy flowers in late spring held in umbels above attractive foliage. 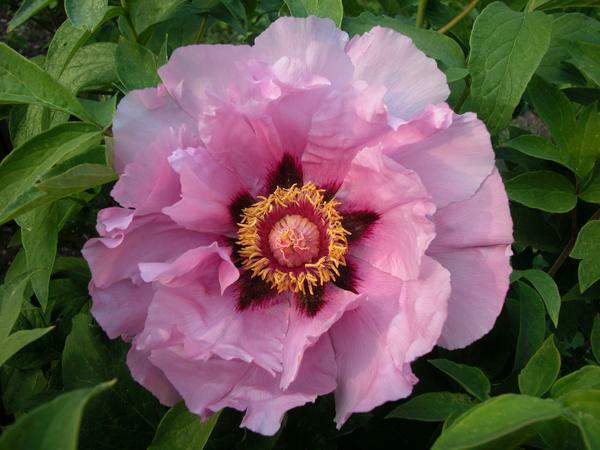 Colors range from white to soft pink to magenta or bluish lavender, and may differ on the petal reverse. Petals may be smoothly rounded or as intricately cut as snowflakes. 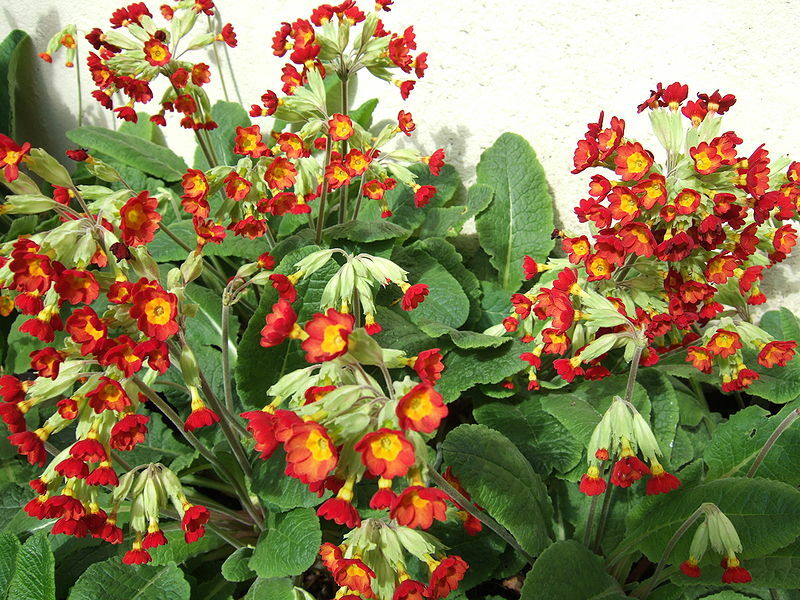 Unlike most primroses, it can go summer-dormant to escape summer conditions that are too hot or dry for it. I grow a cultivar called ‘Smooch’ and find it to be a beautiful, tough, trouble-free plant with gorgeous textured leaves. I love plants that make me get down on my hands and knees for a closer look – and ‘Smooch’ does just that. Its delicate complexity gets me every time – it is fascinating. It spreads from shallow, branching rhizomes, and has spread nicely in my garden. The Candelabra Primrose (Primula japonica, Z4) thrives in moist to wet areas in dappled shade. It can be grown alongside a water feature or pond, or near the house by a downspout that keeps the soil moist. It is a robust perennial with rosettes of finely scalloped or toothed light green leaves. Whorls of red-purple to white flowers appear in mid-May and June. Candelabra Primrose sets seed readily, and forms lovely colonies that display substantial genetic variation as seen in this garden in Plymouth. New plants can be grown from collected seed and planted elsewhere in the garden, shared with friends, or sold at plant sales. 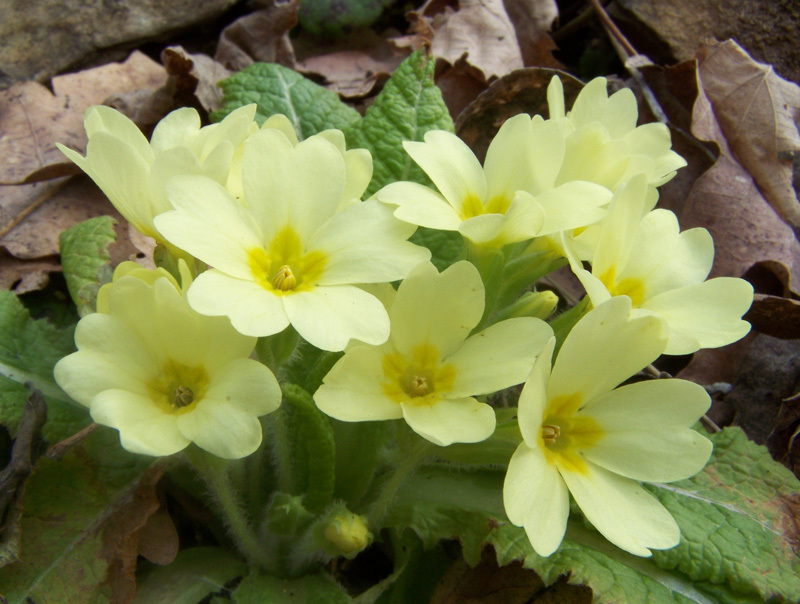 Primula vulgaris (English Primrose Z4) is native to the open woodlands and shady banks of Europe and W. Turkey. It adapts well to the home garden in locations that are not dry. The species has rosettes of bright green leaves and clusters of fragrant pale yellow flowers. It has many hybrids and cultivars displaying a wide range of colors, from purples and reds, to whites and yellows. Primroses are beautiful additions to the spring garden. 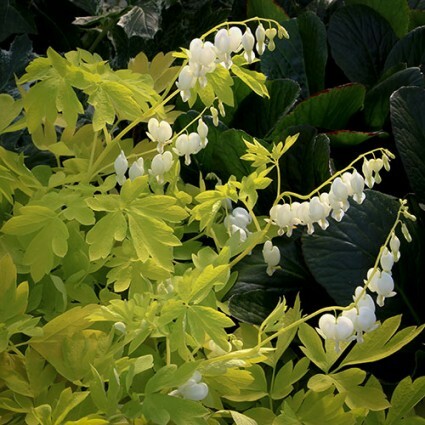 They combine beautifully with other shade plants such as hosta, bloodroot, and epimedium. Given the right conditions, they will add color to your garden for years to come! Daylilies and hosta for dinner? Although my garden is mostly ornamental, I’ve always longed to incorporate more edibles. My efforts at vegetable gardening have repeatedly been met by failure – I’ve been outwitted by chipmunks, rabbits and woodchucks, defeated by grasshoppers, cabbage flies and other pesky insects, and the weather never seems to cooperate with the type of vegetable that I grow that season. So it was with great interest that I discovered Backyard Foraging by Ellen Zachos in the bookstore of Longwood Gardens. I devoured the book in one evening, and am looking forward to tasting many of her recommendations. As Ellen explains in the introduction to her book, many of our favorite garden plants have edible parts that have simply been overlooked. And since many of us gardeners already know what we’re growing in our own backyards, plant identification is easier than foraging in the wild. Sixty-five familiar plants you didn’t know you could eat are the stars of this impressively comprehensive guide, and Ellen stresses the “ease and elegance” of foraging these familiar greens, fruits, nuts, seeds, tubers, and fungi in yards and nearby environs. Do you have an abundance of the orange “roadside” daylilies somewhere on your property? Mine grow right in my compost pile where they were discarded several years ago. I have always known that dried lily buds are integral to Chinese hot and sour soup. But did you know that you can eat them fresh – either raw in salads where the taste is reminiscent of green beans, or lightly sautéed in olive oil with salt and pepper? The best surprise about daylilies? You can eat the tubers, which are like mini potatoes! They are small like baby fingerlings, and are best harvested in fall and early spring when they are plump and full of starchy goodness. Like potatoes, they can be roasted in the oven with a light coating of olive oil, salt and pepper. Every year when I dig my dahlia tubers for storage, I feel like a farmer harvesting her potatoes. Little did I know that dahlia tubers can be eaten like potatoes – boiled, roasted or baked. Apparently they don’t have a strong flavor, so they are a good vehicle for gravies and spices. They can also be grated and used like zucchini in quickbreads. Although I have a hard time picturing all those gorgeous dahlia flowers going to waste, dahlia tubers would be fun to try at least once! I planted variegated Bishop’s Weed in my dry shade garden despite being warned about its invasiveness. It’s good to know that I can harvest and eat it to keep it under control! The plants should be cut at ground level and the stems discarded. Young Bishop’s Weed leaves can be added to salads, where their taste is light, fresh and reminiscent of celery. Mature leaves can be a substitute for cooked spinach in recipes, particularly Greek spinach pie. Can’t wait to try it! Bee balm, also called bergamot, is a member of the mint family, and both its foliage and flowers are useful as herbs. For some people, the taste resembles oregano, while others are reminded of Early Grey tea. You can actually brew a delicious bergamot tea, the chopped leaves may be used as an oregano substitute in recipes, and the chopped flowers make a colorful addition to pasta dishes, rice, pizza, tomato sauces and meat rubs. Like many gardeners, I was enamored with propagating plants early in my gardening hobby, and now I have a plethora of plain green hostas that require a crowbar to remove. It’s great to know that I can serve them for dinner! You can remove a third of the plant’s outer leaves without harming the health of the plant. New, tight shoots can be served like asparagus over pasta and rice. Slightly older shoots that are just starting to open can be briefly blanched , then sautéed and served as a vegetable with or without sauce. In northern Japan, hosta has become a commercial crop. So what’s stopping us? I hope that you’ve been inspired to learn more about “Backyard Foraging”. Sixty more backyard edibles await you in Ellen’s book, which can be found at Amazon. Bon apetit! With such a wide array of flower colors, shapes, heights and sizes, daylilies are fun to collect and use throughout the garden. My own collection began with a mail order of three different pink varieties that arrived as tiny divisions and took many years to grow into sizable blooming plants. Later I discovered Steve Green’s daylily sales in Sudbury, MA, and my daylily border was born. Now that my collection of daylilies has outgrown the border, I am looking for better ways to display them. Through trial and error in my own garden, and by visiting some outstanding display gardens, I have developed a few tips on showing off these beautiful perennials to best advantage. 1. 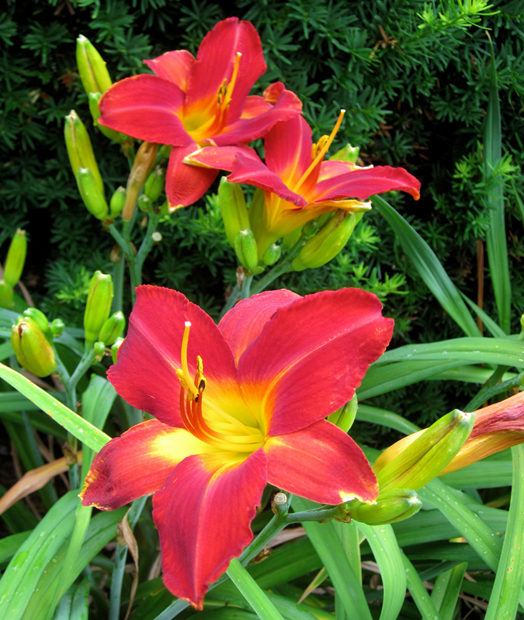 Are you featuring daylilies as the main attraction or will they complement other plants? Daylilies make stunning accents in the garden. A well-established daylily clump can produce as many as 400 blooms in just a single season, and can flower for 4-5 weeks. Daylily flowers light up the solid green mass of a spring-blooming shrub border and look terrific at the base of a large stone outcrop. The maroon highlights on this peach daylily complement the 'Crimson Queen' japanese maple. 2. What colors will combine well with the other plants in the garden? Resist the temptation to collect one of every daylily that's ever caught your eye. Limiting the number of daylily colors in a flower bed makes it more cohesive. Choose daylily colors that will either complement or contrast with the other flowers in your garden. And don’t forget foliage! Plants with maroon, blue, silver or gold foliage provide stunning color contrast for daylily blooms. Maroon daylilies combine beautifully with a purple smoke bush. Daylilies provide the strappy texture of their leaves and the bold, star-shape of their flowers. You can create texture contrast by using complementary plant with variegated foliage, feathery, needled or furry foliage for texture contrast, or oval and round foliage for shape contrast. Plants with daisy-shaped, spiky or tiny flowers also provide a textural contrast. 4. Is the planting intended to be admired from a distance or from close up? The one lesson I've learned over and over again in planning gardens is that fewer varieties with more plants of each variety will provide greater impact of bloom and a better overall sense of harmony. This is particularly true if you’re viewing the garden from a distance. More plants are needed to create an impact. 5. What if you can’t resist new daylilies? Mixed borders and dedicated daylily beds are great for accommodating impulse purchases or swaps with gardening friends. Just remember to provide a soothing background for such a busy border – an evergreen hedge or a large expanse of lawn balances the excitement of a colorful border. The hellstrip — the space between a street and a public sidewalk, also known as a tree park, boulevard, meridian, and planting strip — is getting a lot of attention these days with the publication of Evelyn Hadden’s Hellstrip Gardening by Timber Press. This comprehensive guide with gorgeous color photographs of hellstrip gardens across the country offers inspiration and visual guidance to anyone ready to tackle this final frontier. Hellstrip gardening is nothing new to my friend Kathy, who has been adding curb appeal to her home with hellstrip plantings for 15 years. Kathy began her roadside garden when she got tired of trying to keep the lawn grass alive in the hellstrip year after year. Always keen on water conservation, Kathy wanted a low maintenance solution for this long, sunny expanse. Her large backyard garden had also become shaded over the years as the pine trees grew taller and taller, so the sunny hellstrip offered a chance to relocate her sun lovers from the backyard and to try some new plants in this totally different environment. She began the garden by digging up a small section of sod around her mailbox, amending the soil, and planting various sedums that would be low maintenance and drought resistant. Bit by bit, the hellstrip garden grew, and then expanded to the other side of the driveway. Now it measures close to 100 feet, and boasts a wide variety of perennials. Kathy learned through trial and error which plants to grow, and which plants to avoid. Some perennials, like yarrows, were too tall and floppy. Annuals were too labor intensive, except for the portulaca that self sows and returns year after year. But there were many perennials that acclimated to this dry, sunny area with its relatively poor soil. Mediterranean plants and herbs – many of which sport silver foliage and prefer a sunny situation with lean soil and good drainage, thrive in Kathy’s roadside garden. Sedums, Lamb’s ears, salvia, sage, alliums, fescues, rosemary, thyme, mint, sea lavender, and catmint bask in the baking hot sun. The garden delights passersby with a changing palette of blooms and foliage. In the early spring, crocus, creeping phlox and species tulips, which love the good drainage, cheer up the border with their blooms. They are followed by stately bearded irises, columbines and poppies in June, and daylilies, helianthus and coreopsis in mid summer. A prickly pear cactus at the base of the mailbox surprises visitors with its yellow flowers in July. Sedums steal the show in August. 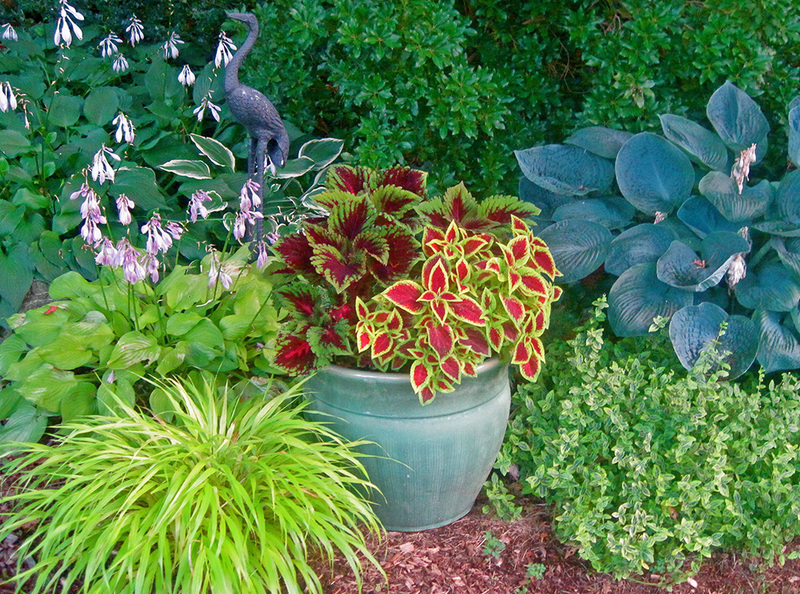 In a shadier part of the garden, hostas and heucheras provided beautiful foliage from spring to fall. Gardening in the hellstrip has its challenges. The soil in these areas is usually cheap, compacted fill. Kathy amends it at planting time with compost, and has been top dressing with leaf mulch. Because of the distance from the house, the garden is difficult to water. Although Kathy does not irrigate regularly, newly installed plants need supplemental watering, which amounts to many trips with a watering can. Weeds easily blow into the garden and crabgrass is a particular problem. Since the hellstrip is town-owned property, large sections have been dug up utility companies several times without prior notice. As Valentine’s Day approaches and we are surrounded by endless bouquets of monotonous red roses, I long for the beautiful red flowers that grace my garden throughout the year. Red has always been my favorite color, and I was quick to incorporate it into my garden. One of my first flower beds was a “hot colors” garden that I could see from my kitchen windows – a large kidney-shaped island of fiery red, orange, and gold perennials set against a background of my neighbor’s lush green arborvitae hedge. These sunset colors define “summer” for me, and I use the perennials in endless bouquets for my home. As time went by, my passion for red outgrew the perennial bed, and found its way into a shrub border that complements this part of my garden. Red rhododendrons, red-leaved Japanese maples and crabapples, and the bright red berries of winterberry carry on the theme. I now have red in my garden through most of the year. When using red in the garden, keep in mind that there are “warm” reds with a touch of yellow that combine well with oranges and yellows, and “cool” reds with a touch of blue that are better with blues and purples. Silver-leaved foliage is a perfect foil for both shades, and softens the brightness of the blooms. This classic red tulip never disappoints! Unlike other tulips, the Darwin Hybrids have exceptional perennial qualities, and mine have bloomed for at least 10 years! A mid- spring bloomer, 22” high with large, bright red flowers atop sturdy stems. This rhododendron has the deepest ruby-red trusses that I have ever seen. With funnel-shaped flowers that have a dark red throat, it is a stunning sight in the May garden. Henry’s Red is a Mezitt hybrid, prefers full sun to part shade and grows to about 5’ tall. A dwarf, low growing, compact shrub with brilliant red flowers in mid May, this azalea is one of the most popular and reliable evergreen azaleas in New England. As a bonus, its foliage turns a handsome dark red in autumn. With deep red flowers gracefully suspended along arching burgundy stems, Valentine is a sophisticated new variety of a beloved garden classic. Plants are vigorous, with plum-colored new growth and bronzy, gray-green foliage. They make a handsome show in large containers. Lusty Lealand sports huge (6.25”) flowers on tall sturdy stems. The deep red flowers have yellow throats and last for several weeks in July. Bee Balm sports brilliant red frilly starburst heads atop strong upright stems. The tubular florets are very attractive to bees, butterflies and hummingbirds. A hardy plant that blooms in mid summer, 4-5’ tall. This begonia, with its angelwing-like, shiny green leaves and large drooping scarlet flowers, is my favorite annual for shady containers. It is a compact, bushy, fibrous-rooted plant, 15-18” tall, with fleshy, semi-trailing stems, and flowers that bloom until first frost. I have good success overwintering these begonias in my house. ‘The President’ Canna is known for its extremely vibrant, large red blooms, and lush, green leaves that are edged with a fine line of burgundy. Cannas add a tropical look to the garden, are perfect for containers, and prefer moist garden soil and full sun. This native clump-forming perennial features erect spikes (racemes) of large, cardinal red flowers on stalks rising to a height of 2-4 feet. It blooms in August to September, and its tubular flowers are very attractive to butterflies and hummingbirds. Since it grows naturally in along streams and springs, it is a perfect plant for a Rain Garden or moist location. This classic dahlia cultivar is enjoying a resurgence of popularity, and no wonder! Its semi-double scarlet blooms are carried above foliage so dark it's almost black. Bishop of Llandaff grows to 36” in height, and blooms July-October. January is a great time to peruse plant catalogs and choose some new perennials to bring pizzazz to the spring garden. After a long winter, I am outside every day in early spring, watching the rapid changes in the garden as the perennials start poking out of the ground. And every year I wish that I had more plants for this delightful season! A silver-leaved Lungwort that shines in shade, this new pulmonaria is mildew resistant with lance-shaped silver foliage and flowers that change from pink to blue. Just what you need to brighten up a shady spot! This variegated Solomon’s Seal has foliage with very broad white margins, and fragrant white blooms in early spring. 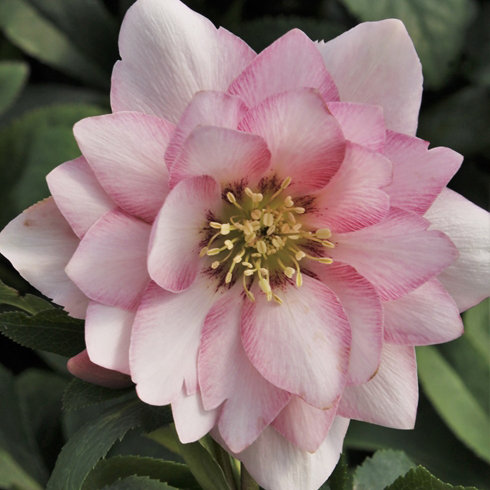 A hellebore with fluffy 2-3” double-petaled blossoms in gorgeous shades of pink with purple speckles. This vigorous cultivar features exceptionally large, outfacing flowers and thick, sturdy stems. Heucheras, also known as Coral Bells, retain their brightly colored leaves throughout the winter, so they are wonderful plants for the spring garden. This variety has spicy, hot paprika colored foliage with silver veining that will add bold flair to your garden. White flowers hover above the blazing leaves. A hellebore with amethyst-rose double flowers margined in opal. The finely sculpted blossoms brave cooler temperatures to become one of the first gifts of spring. There are more than 70 varieties of snowdrops in cultivation, but only a few are sold in the US. This award-winning snowdrop has a dangling white bell composed of several floral layers, each green edged in white. A delightful addition to the early spring garden! I saw this plant for the first time on a garden tour in Boylston in July and was really impressed! Another specimen brought to the US by Dan Hinkley from Sichuan, China, this is a beautiful groundcover for the woodland garden. 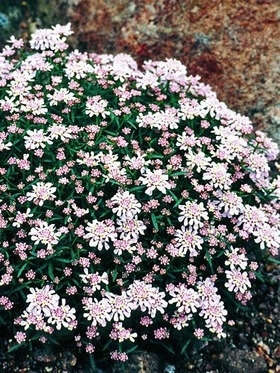 Glossy, heart-shaped purple-tinged evergreen leaves form dense rosettes, and are topped with spires of white flowers. Lathyrus is a non-climbing, clump-forming perennial sweet pea with showy pink flowers and light green leaves. A low-maintenance plant that dazzles in the shady border! Arrowhead Alpines features a stunning 57 varieties of primulas (primroses). These are not the primroses that you find in the grocery store and that rarely return year after year. Primroses are a huge, diverse genus with flowers in every color of the rainbow. Although some species prefer cool, moist conditions, there are quite a few that can take the heat and dryness of the summer. It is worth browsing through this large collection of varieties and choosing a few to try in your own garden this spring. Bearded irises are relatively easy garden plants to grow, and will give good results with a minimum of care. My collection of irises came about through the generosity of a fellow gardener – an elderly gentleman from the Historical Society. We met at a Society function during my first spring in town, and found that we shared a common hobby. On a sultry, hot day in mid-summer, he dropped by with several trash bags filled with iris rhizomes. His mother had been an Iris Society member and avid collector, so the irises that he inherited and then shared with me were heirloom plants and unusual varieties. Twenty years later, their dazzling pale pink, frosty blue and midnight purple blooms light up my garden in late spring. Here in Massachusetts, July and August are the best months of the year to plant new iris rhizomes and divide overcrowded clumps. The irises have finished flowering, and are usually dormant during the heat of the peak summer months. Iris rhizomes that are planted now have plenty of time to have their roots well established before the end of the growing season. 1. To divide a mature clump, carefully lift the entire plant out of the ground. I like to use a spading fork for this job, as it does not cut the roots. 2. Next, rinse the soil off the rhizomes so that you can see any diseased areas. 3. Separate old, exhausted, unproductive rhizomes from new, young growth. 4. Cut off any portions that are brown inside and discard. 5. Slice the healthy portions into chunks about 3” in length. Make sure each piece has its own roots and leaves. 6. Prepare a planting site in full sun where the soil has excellent drainage – raised beds and slopes are ideal for this. Amend the soil with compost. 7. Space the plants 12-24 inches apart. Clumps of three plants set in a triangle with the rhizomes facing into the center makes an attractive grouping. 8. Lay each rhizome horizontally in its own shallow hollow. It needs to be half-buried so that the back of each rhizome is visible (like a floating whale). Tamp the roots firmly into the ground to anchor the rhizome. 9. Trim the leaves to about 6”. This will reduce transpiration while the plant is becoming established. 10. Keep well watered. Newly planted rhizomes need moisture for their root systems to develop. Once established, irises should be watered when the top three inches of soil dry out. Over-watering irises is a common mistake once and will lead to rot. 11. Fertilize with superphosphate or a well-balanced fertilizer with an N-P-K ration of 10-10-10. Avoid fertilizers high in nitrogen as they encourage soft growth that is susceptible to disease. Bearded iris are a great addition to the garden with their beautiful flowers in spring, and their bold, vertical foliage throughout the growing season. Dividing your plants regularly will keep them vigorous and healthy and provide you with years of enjoyment!